We get it. A UX designer is not the same as a UI developer. Not to mention a UX researcher. Why lump all of you guys together? See, UI/UX resumes follow the same best practices for UX designers and UI developers alike. Now, do you really have to worry about your UX or UI developer resume? According to the US government, UI/UX jobs will grow 15% by 2026. You could use green ink on blue paper and get the job. Right? It's true good designers and developers are in demand. But you want benefits, flexible work, and a higher UX designer salary than Irene Au. To get those jobs, your resume must stand out like Apple's homepage. You're 7 minutes from writing a resume like that. UI and UX designer resume examples better than 9 out of 10 others. How to write a UX or UI developer resume that gets more interviews. Tips and examples of how to put skills and achievements on a UI/UX resume. How to describe your experience on a resume for a UI/UX designer to get any job you want. 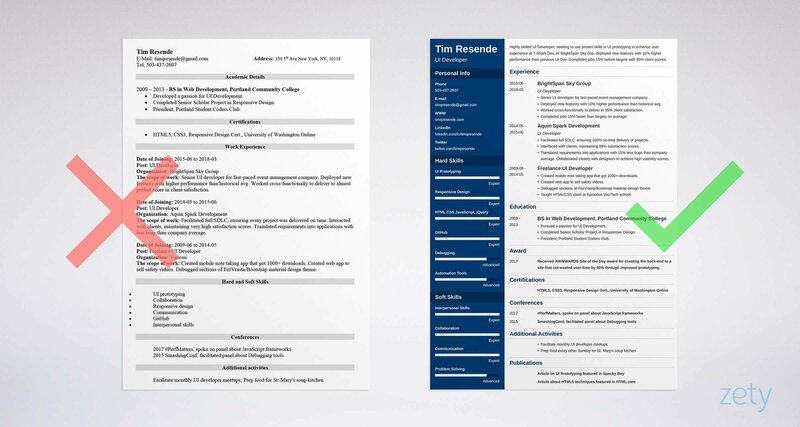 Here's a sample resume for a UI developer made using our resume builder. And here’s a UX designer resume sample. What's the Best Format for a UI Resume or UX Resume? Don't make the hiring manager think. Give your information in a strong visual hierarchy. By using the best UX/UI developer resume format. It's the chronological resume format, and it's popular for a great reason. It puts your most relevant achievements above the fold. Use white space, the best resume fonts, and clear headings. Just like in a great website. Looks like the familiar F-pattern! We both know usability is crucial, so give the employer what they need when they need it. What about designer resumes with photorealistic backgrounds or word art themes? Resist the urge to make a creative front end developer resume. Keep it functional and friendly to impress the manager. Save the art for your portfolio. The same resume in terms of content will get rejected by about 26% of recruiters when it’s formal. If it’s creative? About 41% will reject! Not enough evidence for the UX researchers out there? Another study suggests a similar outcome for resumes with fancy formatting: 28% of decision makers consider elaborate formatting a dealbreaker. Finally, should you send a PDF or Word doc resume? Unless the job ad specifies, send a UI or UX designer resume PDF. In 2018, PDFs are machine-readable. That means they work well with Applicant Tracking Software. Plus, MS Word doc resumes can turn horsey in transit. Pro Tip: Switching careers? Got resume gaps? 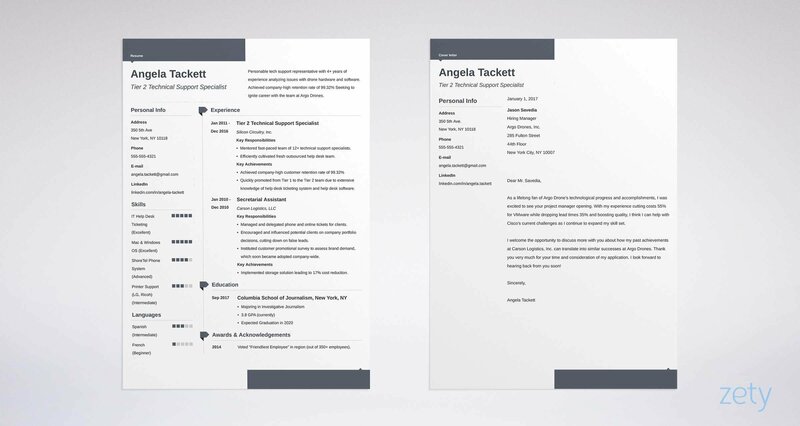 Consider the combination resume format for your ux designer resume or ui designer resume. It trophy-cases all your best transferable achievements. Need to ideate some other options for your user interface developer resume format? Working on a UX resume? See our guide: The Best Resume Format: How to Get the Formatting Right? Imagine a web development hiring manager. Her name's Mariana. —and 300 UX/UI resumes to get through by lunch. She'll spend six seconds on each one. How can you grab her attention like a Banksy installation? A resume summary uses megamenus of experience to prove your hireability. For an entry-level UX designer resume or UI developer resume, consider a resume objective. An objective shows your goal when your work history is in the Hello World phase. Stuff either one with plenty of achievements. The UX resume examples below provide a walkthrough. UX designer with 4 years of experience. 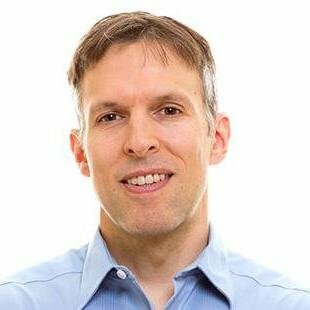 Responsible for UX design at Tavona Arc Design. In charge of collecting project requirements and delivering all jobs on time, including all design elements and color schemes. That's not as bad as a 90% bevel, but it won't unleash a torrent of interviews. Talented UX designer with 4+ years of experience, seeking to elevate UX at Spinx, Inc. As lead UX designer at BronzeCast Futura, received 95% client satisfaction scores. Completed projects 10% before goals with 25% higher UX scores than average. Honorable mention, 2017 UX Award. Highly skilled UI Developer, seeking to use proven skills in UI prototyping to enhance user experience at T-Shark Dev. At BrightSpan Sky Grp. deployed new features with 10% higher performance than previous UI Developer. Completed jobs 15% before targets with 95% client scores. That's Steve-Krug-level. The measurable achievements add value. Don't have resume experience like that? See the next junior front end developer resume and UX designer resume examples. Is your UX/UI design experience too minimalist? If so, use a resume objective. Back in the days of 8-bit animated GIFs, that meant saying, "Here's the kind of job I want." These examples do it right. The first is for a user researcher resume. Energetic UX Designer, skilled in Sketch and UX research. Have completed several projects, including design of an ecommerce webapp, mobile to do list webapp, 5 wireframes, and improved UX for local animal shelter site. Goal-focused UI Developer, skilled in UI prototyping. Taught a voc/tech class in HMTL/CSS last year. Finished several projects in debugging and app creation, including a mobile note-taking app that got 1000+ downloads. Compared to that, the other resumes are Greek. Those UX/UI resume examples have the right mix of measurable accomplishments. But what if you don't have UI/UX experience like that? Pro Tip: Put your most impressive achievement in your UI/UX designer resume summary. It's the magnet that attracts the hiring manager to your resume. Who gets the best UI and UX designer jobs? The designers with the most experience? Or those who show it best on UX designer resumes and front end developer resumes? Would you be shocked to know it's answer #2? See, there's a key to listing your experience. It hits the hiring manager like a borderless display. First, pick your battles. If you’re writing a UI developer resume with 7 years experience, don’t list everything you ever did. Just add 3-5 bullet points with your best achievements that fit the job. The professional UX and user interface developer resume examples below show how. Senior UI developer for fast-paced event management company. Deployed new features with 10% higher performance than historical avg. Worked cross-functionally to deliver to 95% client satisfaction. Completed jobs 15% faster than targets on average. Lead UX designer for high-end design firm. Received 95% positive feedback from clients. Completed projects an average of 10% before deadlines. With those UX design resume and UI developers resume samples, the hiring manager will call you so fast her fingers will catch fire. Responsible for finishing projects within deadlines. Worked with cross-functional teams to turn client requirements into finished apps. Flat. There’s no measure of performance. But what if you don't have UI/UX experience? See the entry-level UI/UX designer resume examples below. Even in an entry-level UX designer resume, you need experience. Transferable achievements from non-UI/UX jobs. Maybe you designed a wireframe in a retail job? Made a home page for a restaurant? Fake projects in Sketch or Illustrator. Do a mockup of a website, or redesign a site or web app. Do freebie or freelance jobs for local businesses, for friends, or found online. Consult for a friend who has a few design questions. Do UI/UX volunteer work. Example: create the site flow for a local soup kitchen. See that work in these entry-level UX and UI developer resume samples. UI Developer Experience: I'm still looking for my first design job, but I'm a very hard worker. As pretty as an LA parking sign. Designed ecommerce webapp to sell calendars. Created mobile to do list web app. Designed wireframe for local flower shop. Improved UX scores 15% for animal shelter website. Created mobile note taking app that got 1000+ downloads. Created web app to sell safety videos. Debugged sections of FezVrasta/Bootstrap material design theme. Taught HTML/CSS class at Epicodus Voc/Tech school. Pro Tip: For a UI/UX designer or developer, networking is crucial. Find people a few years ahead of you. Don’t try to rush them for a referral. Just ask about their careers The insights you gain will be invaluable, and who knows what it could lead to. You need education on a UX/UI designer resume. But if all you do is list it, it's like buying Sketch and then just using it to draw a duck. Add relevant achievements to hyperlink your UX designer resume to the job. See these next UX designer resume and UI developer resume examples. UX job requirements: Visual communication skills and UX research skills. Excelled in UX Design classes. Executed a Senior Project in Visual Communication. Wrote weekly column on UX Research for school paper. UI job requirements: Responsive design, leadership. Pursued a passion for UI Development. Excelled in Responsive Design classes. President, Portland Student Coders Club. Those aren't generic UX/UI designers. They're Bill Buxton or Laura Klein in prototype. That could be anyone. It’s as bad as too much white space. Is your education a gating item? Brush up with Skillshare, Design tuts, and Lynda. You can add them to your entry-level UI developer resume or UX design resume. Pro Tip: Can you leave your GPA off a resume for UI/UX jobs? Yes, especially if it's unimpressive or a long time in the past. The hiring manager for the best UX job ever is convinced you've got the skills. If you can make that happen, you will get the job. So, let's link you to that outcome with your UX or Java UI developer resume. First, know what skills the hiring manager wants. They’re in the job ad. Second, don't just list them. Show a snapshot of you absolutely nailing them. These UI resume and UX resume examples do it perfectly. UX/UI Designer Skills: Fast worker, gathering project requirements, Adobe Creative Suite. Managed UX design for 90% of customer jobs. Collected project requirements with 97% customer satisfaction. Slashed lead times for client jobs by 31%. That’s better than iOS elastic scrolling. Here are some UI/UX and UX researcher resume keywords to get started. Use those design skills in your resume. Follow the plan outlined above, and your user interface developer resume will look like MSTQ designed it. Pro Tip: Does networking sound daunting? It can up-level a UX/UI resume. Reach out to friends of friends or total strangers. You'll be surprised who will respond to you. You list the right experience and education on your UI/UX developer resume. That'll put you in the top 50. But how can you beat the other 49? Well, let's get back to Mariana, our web dev hiring manager. She wants to know you're more than just a resume. Show her with dedicated "other" resume sections. We've got some in the next UI/UX developer resume examples. Hey, tlhlngan maH! Right? But neither of those make you a better UX/UI developer. Robust. That UX designer or front end developer resume is as classic as the IBM logo. Yet you probably have plenty of extras like that, or you can get some fast. Pro Tip: Do you need a certification to be a UX/UI professional? No, but they do boost entry-level UX designer resumes or UI developer resumes. What About a UX/UI Designer Cover Letter? Only if you want the hiring manager to read your resume. Don't go generic. "Hi, here's my resume" UX designer cover letters are worse than carousels and slideshows. Make yours personal and helpful. Start your cover letter with the hiring manager's name. Show you understand the job offer. Give a big hint you can do the work. I've been intrigued by T-Shark Dev's approach to customer-focused web development for several years. The way you handle everything from typography to content structure to brand consistency is unparallelled. I believe my own UX skills would fit in nicely, as evidenced by my honorable mention in the 2017 UX Awards. What about a CTA button? Add a call to action to end your cover letter. Use something like, "I'd welcome the opportunity to explain how I boosted UX scores by 25%." Pro Tip: Put your best achievement in your UI designer cover letter. Make it relevant to the job ad. It'll make your UX/UI designer resume more memorable. Wow, you almost missed this. There's one crucial bit of contact info you can't leave off your UI/UX developer resume. But don’t send a UX resume without a link to your UX portfolio. You can also redesign a web app, or make your own. Create a very simple mobile app or two. A UI/UX designer portfolio is like extra credit on a designer resume. Find some great examples in this article on great UX/UI portfolios. You should also add LinkedIn to your UX design resume, since 87% of recruiters hire from LinkedIn. To interface your best bits fast, use a UX designer resume summary. Put your best 2-3 achievements in it. Read the job description like an email from Jeff Bezos. Fit it to your UI developer resume with measurable accomplishments. A great designer resume needs “other” sections. Stuff yours with awards, commendations, publications, and volunteer work. Finish it off by writing a great cover letter. Do you have questions on how to write a great resume for a UX/UI designer? Not sure how to describe your skills or achievements? Give us a shout in the comments! Let's get you in that dream job.